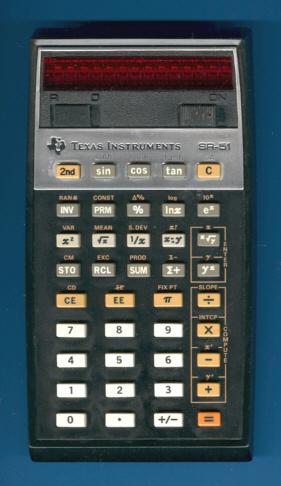 With the SR-51 Texas Instruments started a series of scientific calculators that added statistical functions and conversions to the "usual functions". You'll find similar performance and keyboard layout in the line SR-51 -> SR-51A -> SR-51-II -> TI-55 -> TI-55-II -> TI-55-III. But none of them was engineered as perfect as the SR-51. It was built like a tank to survive decades of use as its close relative SR-50. Compared to the previous models the SR-51 got a keyboard design with white, grey, yellow and orange keys and gave an outlook to later TI calculators. Don't miss the rare SR-51 Clear-Case Prototype. To reduce manufacturing costs and to give a similar appearance to the SR-52 and SR-56 calculators the SR-51 was replaced within few month with the SR-51A. The calculator on the left was manufactured in March 1975, earlier models used bold printed characters for the shifted 2nd- functions and a different cancel exponent entry label (above the [EE] key). Compare them here. The SR-51 was the first calculator in TI's line using stacked Integrated Circuits (Piggy Back IC's). Please note on the right picture the two SCOM circuits. Interesting to know, this calculator works with the PC-100 "Printer Cradle" developed for the SR-52 and SR-56.